Over the past 8 years, Stone Cold Magic Magazine has been an outstanding resource for magicians around the world. A year ago, the magazine was officially retired. Since the inception of the magazine, a whole new generation of magicians have come "online," and many of them want to know how to get more gigs, how to manage the business of magic, how to improve as a performer and more. They're also, of course, looking for tricks to add to their repertoire. 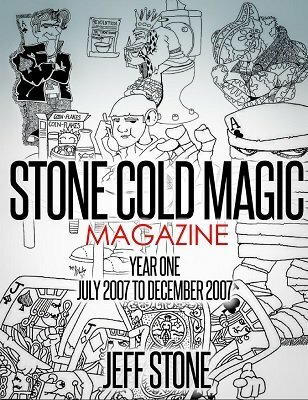 Well here it is again, the volume that started it all, Stone Cold Magic Magazine Volume 1 (July 2007 through December 2007). In this volume you'll be introduced to the crazy characters from Hoyletown and Bicycle Village that make up The Saga. You'll learn six effects, some of which are not available anywhere else but right here in this compilation. Cards, coins and paper currency are just some of the props used in the six effects taught; there's something for everyone. On top of the crazy characters and the magic effects, you'll dive deep into the psychology of magic in The Full Montoya. You'll learn to improve yourself as a performer in Roots and Branches, and No Stone Left Unturned will take you step by step through the beginning of improving your business and becoming more profitable and more hire-able. Additionally, many of the articles have bonus "2015 Updates" adding new and updated content not available in the original publication. Clocking in at just over 120 pages, Stone Cold Magic Magazine Volume 1 is packed with extremely valuable information for all magicians regardless of skill level or experience. "I have today begun subscribing to your superb magazine ... What a terrific collection of thoughtful, useful and inspiring writing." - Bruce G.
"I got to say mate, I really enjoy your magazine and its content." - David L.
"The first issue arrived, and now I'm able to check all the stuff in your magazine! Its great! Thanks . . . I can use a lot of this tips and tricks and so on, great thing!" - Gerd M.
1st edition 2007, 120 pages.